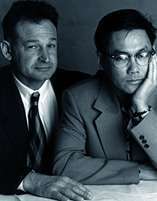 In 1979, Kwan and Iger began their collaborations after they spent 6 months traveling around the world on a student budget. While in India, they were inspired by some itinerant performers, using a painted scroll with small pictorial images. As one person unroll the scroll, he or she would points at a picture as another person perform live music while another dance to rhythm to exaggerated the movement, it was like watching a multimedia performance in the rawest and purest form. They return and began their performance art pieces, using super 8, 16mm black and white films, slide projectors and something with live musicians on the side of the stage, other times with taped music. They also collaborated on visual arts by showing their works in local galleries, and art installations. They wanted to broaden their audiences by creating education videos for local and national PBS. They have been working together for 20 years on various different projects, they argue and fight like cat and dog on each of their collaborations.